Most people think of New York City as a playground for adults. However, the truth is that NYC is full of fun attractions and sightseeing opportunities for youngsters and families. Families can play, learn and be inspired on the streets of the Big Apple when they know where to look for great attractions. There are also some pretty great places to pick up sweet treats that are irresistible to kids of all ages! Here’s a look at the best tips for sightseeing with kids in New York City. The SeaGlass Carousel at the Battery Conservancy is a whimsical attraction. 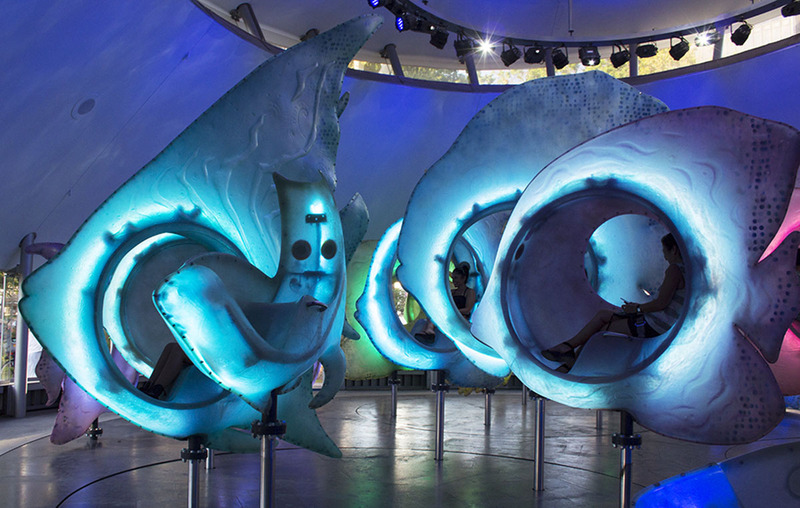 Riders get to glide along on large iridescent fish that glow with LED lights. This attraction is open seven days a week. Washington Square Park is an iconic patch of beauty in the lower part of Manhattan. The park features a towering fountain that has been featured in countless movies. Youngsters love this fountain because it has shallow wading areas that can be used to splash around and cool off on summer days. Parents love the fact that there is plenty of shade where they can sit and watch their little ones cool off. Do you have a sweet tooth? The trendy neighborhood of Greenwich Village is where the cupcake craze of the past decade really took off! Walk around and try to taste as many cupcakes from the great confectioneries in this neighborhood as you can. The New Victory Theater is the premier performing arts venue designed especially for youngsters in New York City. Visitors get to enjoy dance, music, circus performances and more. The performances here range from well-known plays to innovative creations that have never been seen anywhere else. What could be better than a family adventure that involves taking the Roosevelt Island Tramway over the East River to get to Roosevelt Island? This fun destination offers a great escape from the city because of its scenic paths. You can also visit the North Point Lighthouse while you’re there. This attraction offers a dose of playfulness in the middle of the Manhattan Financial District. The attraction is built in a unique way that allows children to manipulate the space as they build up and knock down components of the playground. It features giant foam blocks and mats. This fun sports complex takes up 28 acres along the Hudson River. It features a pool, a bowling alley, a driving rage and a field house that’s 80,000 square feet in size. Of course, what children usually love most about this place is the indoor skating rink that can be used 12 months of the year. Teardrop Park is a two-acre park that’s unlike any other play spot in the city. It was designed by famed landscape architect Michael Van Valkenburgh. Little ones can have quite a time as they glide down slides, splash in water and kick around in sandboxes. A water-play section that’s available in the summer offers a great place to escape the city heat. The historic South Street Seaport is an amazing spot for children who love ships and maritime history. Visitors get to enjoy exploring six historic ships. There are even opportunities to sail around the New York Harbor when visiting this attraction. The Bronx Zoo offers a wild time for people of all ages. Explore a park that covers 265 acres and serves as the home of nearly 4,000 animals. This zoo hosts gorillas, snow leopards, elephants, rhinos, red pandas, sea lions, penguins and more. Walking around the Big Apple can definitely work up a big appetite! Head to Little Italy to get some pizza by the slice. You can even follow up your slice of heaven with some otherworldly gelato. One World Observatory at World Trade Center offers panoramic views of New York City from the tallest building in the United States. In addition to great views, this attraction offers tons of fun educational tidbits about the city. There are also exhibits and restaurants. Coney Island is the ultimate family-friendly spot in New York City. Coney Island’s Luna Park features fun rides, coasters, games, street performers and views of the sea. You can time your visit to see a live concert or catch a minor-league ballgame at MCU Park. Where can you go when the kids just need to run free in the city for a bit? Sprawling Flushing Meadows–Corona Park is home to the famous Unisphere from the 1964 World’s Fair. In addition, visitors will find a zoo, a boating area, a skate park and a carousel hidden in the vast rolling fields that make up this park. You can also visit a botanical garden or enjoy a stroll along the Flushing Bay Promenade. Go back in time by hopping on the ferry to Staten Island to visit an old-fashioned town that has been brought back to life by the Staten Island Historical Society. This town hosts a variety of family-friend activities throughout the year. Plan your visit to enjoy pumpkin picking in the fall or enchanted evening candlelight tours all year long. This historic carousel from 1922 has been frozen in time. This treasure was painstakingly restored over a period of decades before finding a permanent home in one of New York’s trendiest neighborhoods. Children can now go round and round while enjoying stunning views all around them when they jump on this true work of art. A visit to the American Girl store at Rockefeller Plaza is a must-do activity in NYC for any doll lover. Visitors can have fun shopping, playing and being creative. This location hosts fun events throughout the year. This iconic zoo is small enough to cover in a quick visit. Youngsters can delight in snow leopards, penguins, bears and a small petting zoo. You can also schedule your visit during feeding times to see how animal specialists give some of the animals in the park the nutrition they need to thrive. Brooklyn is currently home to a big chocolate scene. In fact, you can barely walk a block in this borough without coming across a trendy artisan chocolate shop. Spend an hour tracking down the best chocolate in Brooklyn and see how many amazing flavors you can enjoy. Tour this iconic skyscraper in the heart of Midtown Manhattan with your family to get the true New York experience. The building’s observation deck offers the best views of the New York City skyline. It’s possible to book tickets for sunrise if you want to see what it looks like when the sun first glides over Manhattan’s skyline. The Children’s Museum of Manhattan is a place that’s designed for children under the age of six. It’s a perfect spot to visit if you want to get off of the busy sidewalk for a bit to see exhibits and participate in fun activities. People in New York know Dylan’s Candy Bar as the place with the giant lollipop tree. This popular spot offers one of the widest collections of sweets in the world. In fact, you’ll find over 7,000 different confections here. You can scoop up bags of candy or indulge in sundaes covered in hot fudge. New York City’s Chinatown is a great place to go shopping. Children will love picking out some fun, colorful trinkets or picking up some cute, low-cost fashions. This is also a great place to try some very authentic Chinese snacks without leaving the country. People of all ages love visiting the flagship Nintendo store at Rockefeller Center. The store takes up two floors and covers 10,000 square feet of space. Visitors can test out games, buy merchandise and take part in fun in-store activities. This gorgeous space offers a touch of nature in the concrete jungle that is New York City. The High Line’s elevated position means that you can catch some glimpses of the city that would otherwise remain unseen. Entry to this public park is free. Seeing the Statue of Liberty is essential when visiting New York. Getting up to Lady’s Liberty crown once you arrive only takes about 10 minutes. Visitors can enjoy both guided and self-guided tours. The American Museum of Natural History is an iconic American institution that has been in New York City since 1869. This world-class museum boasts an amazing collection of exhibits. Young visitors can tour exhibits or participate in interactive events throughout the week. This theater is actually a log cabin inside the park that is 140 years old. The shows performed here are based on classic fairy tales and stories. Shows take place here nearly every day of the week. M&M’s World is 25,000 square feet of space devoted entirely to one of America’s favorite candies. Tour multiple floors to discover delicious candy, find fun merchandise and meet the M&M characters in person. Visitors love the famous candy wall that features thousands of M&M candies in all varieties. Broadway offers all of the fun, culture and entertainment that New York City is famous for. There are plenty of performances of family-friendly shows like “The Lion King” and “Frozen” going on throughout the week and on the weekends. You can usually get a great bargain on tickets if you’re going during the afternoon. Of course, simply sightseeing on Broadway and taking photos of the marquees can be a lot of fun!